Pakistan Institute Of Medical Technologies (PIMT) Islamabad. 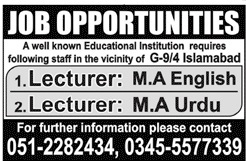 A well known Educational Instruction requires following staff In the vicinity of G-9/4 Islamabad. Qualification: Minimum M.A English from HEC recognized University. Qualification: Minimum M.A Urdu from HEC recognized University. House No. 16, Street No. 55, Peshawar Morr, G-9/4, Islamabad.